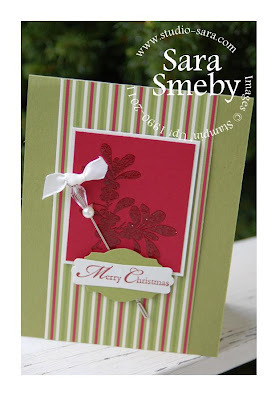 The large image is the background stamp from A Cardinal Christmas, embossed with Clear Embossing Powder. 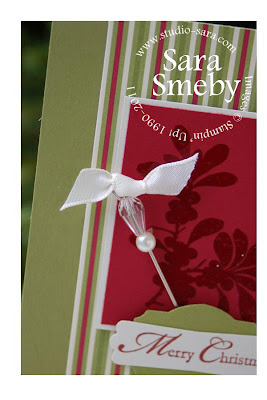 It's layered on a piece of Very Vanilla card stock, as it helps the piece stand out from the stripes of the Jolly Holiday Designer Series Paper. A simple knot is tied through the loop in the top of the stick pin and then beads are added. I used Mini Glue Dots to adhere the whole thing in place (I didn't want the knot to spin). The sentiment is one of my favorite punch treatments. I've layered the Modern Label over the Designer Label. They're both popped up on Stampin' Dimensionals. Hope you are able to enjoy this fun, anticipation-filled time before Christmas! Thanks for your visit!